Over 500 entries for Nationals! Valley Springs M/C is grateful for and humbled by the enormous support for the 2014 AMA Hillclimb Grand Championship – for only the second time in history, there are over 500 entries for the event! The only other time that’s happened was in 2012…also at VSMC. We couldn’t ask for better support and enthusiasm from hillclimbers all over the country…and to make sure we put on the best possible event for those 500+ entries, we’re going all-out with every facet of the event. 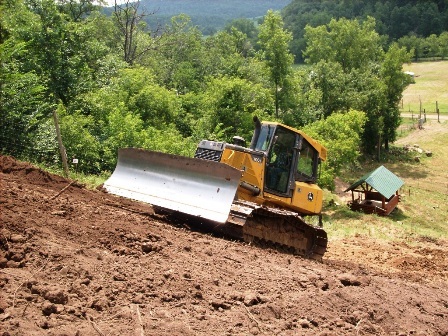 One thing we’re doing is totally working over the entire hill – or at least, as much of it that we can possibly put a dozer on (which is likely every inch of it except the last 100 feet or so). Countless tons of fresh dirt have been brought up, and we’ve had the dozer cleaning things up and moving the dirt around to not only present a bit of a different hill this time, but to make sure the hill over all is simply in the best shape it can possibly be in. More photos in the forums – go take a look!